Are Environmentalists Shooting Themselves in the Foot? To celebrate 26 years of publishing Whatcom Watch, we are printing excerpts from 20 years ago. The excerpt below is from the May 1997 issue of Whatcom Watch. Editor’s Note: Bob Keller died in February 2017. 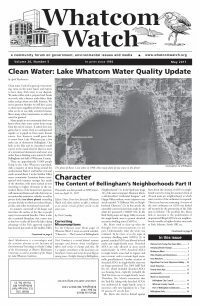 A long-time contributor to Whatcom Watch, the paper printed over 40 of his articles, interviews, letters and book reviews between April 1993 and March 2015. As the below article shows, he liked to challenge the status quo. Environmentalists do themselves, and everyone else, a disservice by frequently operating in a public attack mode, especially when the attacks are mindless knee-jerk know-nothing reactions based largely on emotion and prejudice. Most of us are familiar with the green mantras, the eco-rhetoric, and the endless whines. Even when partially true, such complaints soon grow tiresome or worse — worse being that they are ineffectual and easily dismissed. Last summer’s Bellingham rally and protest against Trillium’s Rio Condor Project in Chile demonstrated this fashion of softheaded close-mindedness. Nobody in the media or the audience at the Whatcom Museum, including Whatcom Watch and me, bothered to point out misleading deceptive and inaccurate information presented at the gathering; no one condemned faulty claims and tactics that would have done Chuck Cushman proud. During the next afternoon’s demonstration at Cordata Place, the public witnessed Wise Use tactics gone green: Bring an outside “expert” who supposedly represents “the common people” and have her denounce Trillium’s Northwest practices, about which she knows nothing. More recently, when Bill Dietrich of The Seattle Times wrote a careful four full-page report on Trillium in Chile, he was personally attacked and chain sawed by environmentalists who did not bother to engage his information or his ideas. In their fury, they even missed the single most telling point in his article — that Trillium now plans to re-analyze its entire Pacific Northwest timber operation. The treatment of Dietrich was not a response to some hack cub reporter: He is a Pulitzer Prize winner on the Valdez Oil Spill and author of perhaps the best book on the region’s old growth forest controversy. He is also one of the most careful thinking, knowledgeable, reflective and dedicated conservationists I happen to know. This time he did not write what certain environmentalists wanted to read, so he’s accused of “fluffery” and “selling out.” Ken Wilcox’s column for the Times moved a bit behind this by seeking a dialogue, but Ken was an exception. “The vituperative responses [to Trillium and Dietrich] make me wonder why any individual or company would bother to try doing things any differently than they have in the past. What is the incentive? Why not just go ahead and clearcut and grow plantations on a 40-year cycle? In this regard, it has often seemed to me that hard-core timber beasts and hard-core environmentalists are in basic agreement on the notion of continuing to do things the same old ways – i.e., to divide our forest landscapes either into insensitively managed tree farms or into preserves, differing only in how the pie should be cut.” Franklin letter, February 2, 1997. Another example of knee-jerkism was a recent Bellingham editorial on saving the mountain goats of Olympic National Park. Despite biological studies that cover twenty-five years, animal rights activists emotionally oppose non-native goat removal or extermination. These views were accepted and endorsed by The Herald without bothering to study the issue or consult local scientists. Biologist Rich Fonda’s precise, well-documented rebuttal in the February 20 Herald placed that matter at the level where it should be discussed: Where is the evidence, by whom, how sound, and with what consequences? ”Not one of the twenty or so people in the audience admitted to having even looked at the book. Some rudimentary shots were fired. Man of us had come because we heard Easterbrook was anti-environment … most questions tended to challenge him on broad grounds … the debate seemed to be about details, not the overarching picture … the question and answer period was more dull than controversial. Having quietly rolled to a halt, the evening ended and we wandered away.” Whatcom Watch, February 1997, page 3. It’s not clear whether Greg Hefron or Mitch Friedman, who “found little to grab on to,” realized how dull-minded, self-condemning and embarrassing their own behavior was. It’s a basic principle of fair and logical discourse that we not pretend to analyze, much less attack and denounce, a book or author that we haven’t read, even if the author is a fool (which Easterbrook was not). Responding to a short oral presentation in a bookstore does not substitute for plowing through a 750-page book that challenges our basic assumptions. When this article was written, Bob Keller was a retired professor of history. He taught at Fairhaven College of Western Washington University.